Superior training for every level of athlete. At E.A.T.S. 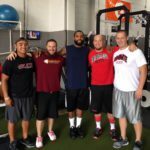 our Staff of Professional Sports Performance Coaches are committed to ensuring all our athletes maximize their athletic potential and are prepared for the highest level of competition. In order to ensure this athletes must dedicate themselves to a consistent and progressive training regimen. Our programs will yield incredible results if adhered to with passion and a positive attitude. Make a commitment to excellence with E.A.T.S. * Training packages may be adjusted from month to month but a minimal training package must be maintained for the duration of your commitment.